Growing up, I was the youngest of three and only daughter in my family. I grew up playing baseball, racing bikes (uh, mine had training wheels.. but whatever), running around outside, and reinacting favorite scenes from our Disney movies (ALWAYS fight scenes). I loved being one of the guys back then, and I love it still to this day. One thing I DO NOT like though, is rough-housing. No, that’s not harsh enough. I absolutely hate rough-housing. I hate it! I can’t stand it. There has never been an instance where I was involved in rough-housing and I walked away thinking, “Man, that was fun.” As I began compiling my stories of the consequences of rough-housing, I realized I actually have too much material. Too much, I say! So this is going to be the first of a 3-post series covering my horrible run-ins with rough-housing. The following stories are listed in chronological order, and as they progress, they become increasingly more terrible. I went to a small private Christian school my entire life, and over the course of those 12 years, I came to love many different traditions. One of them was going to the roller rink on class field trips. For the life of me I cannot figure out how setting a bunch of rambunctious children loose on a well-varnished, low-friction floor surrounded by cinderblock barriers with rolling contraptions strapped to their feet ever sounded like a good idea, but when you’re young you don’t think of things in those terms, because you got to skate. YOU GOT TO EAT PIZZA, AND YOU GOT TO SKATE. This particular incident happened on one such field trip when I was in either 1st or 2nd grade. We had been there for an hour or so, and we had all acquired our skating legs. We had all braved skating into the bathroom and practicing coordination in the precarious stalls, and were all feeling really good about our skills on the rink. As our small brains struggled to find new ways to entertain ourselves, someone suggested the almighty temptation: high-speed tag. This was an invitation no one could pass up, and all 30 of us eagerly took to the rink, all secretly mocking the first person to have to be it and praying that it wasn’t us. I don’t remember who was it first or how long we had been playing before I was tagged, I just remember that I ended up being it and that I began skating ferociously to tag my other friends. It would surprise no one to know that skating and keeping up with the other kids was a problem for me because of my shortness (short legs=shorter strides, short arms=restricted reach), but I also lack coordination in general. My friends were all better skaters than me, but I got pretty good at cutting people out from the pack and chasing them down. This was partially due to my strange obsession with wolves that wasn’t fully realized until 3rd grade, but also because it kind of made sense to only go after a few and not the whole pack. 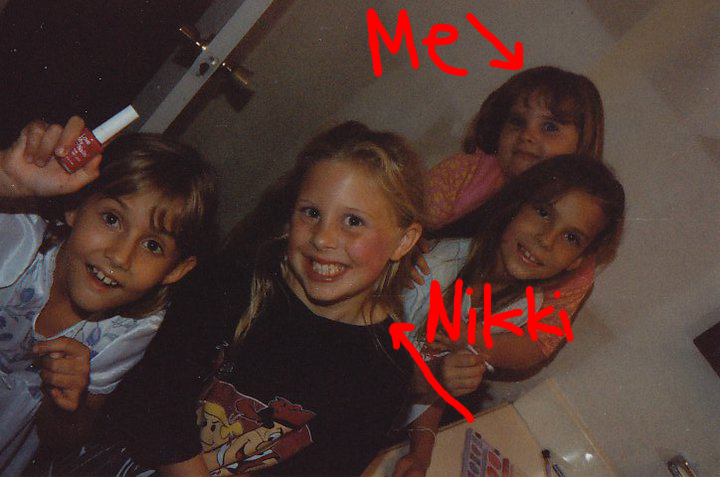 In this particular instance I had managed to cut off 3 girls from my grade, one of whom was my friend Nikki Karol. One of my birthday parties. At this age I was less than 4′ tall..
She and I were besties and she was the one I was really aiming for. She was also considerably taller than me, so she managed to stay out of reach. Well, after chasing her for a while, I realized I needed to do something drastic or I was going to run out of energy completely. And that’s when I developed my plan. I knew that I was without a hope if I was going to keep going at my normal pace and gently try to reach out to tag her. I also knew that when I played baseball with my dad and my brother and his friends, they would always commit to stealing their base or getting that run, and I had seen enough of those slides to know how to do it properly. I set my plan, and everything was going off without a hitch. I was increasing speed and was nearing my target even more quickly than I had projected. All systems were go; I began my lunge forward and then discovered the one variable I hadn’t taken in to account: Nikki’s speed. Whether out of exhaustion, needing a bathroom break, or needing a drink, she had begun to slow down to exit the rink, but I was in no position to stop. I had committed. And my commitment ended up in me skate-tackling my friend Nikki – someone I loved very dearly – right into the cinderblock wall. Thankfully there were no broken bones involved, but the thing that broke Nikki’s fall was her tooth as her face came crashing into the edge of the painted cinderblock wall. Suddenly all feelings of joy were gone , and everyone went into crisis mode trying to find the missing chunk of Nikki’s tooth and me trying to stand under the terrifying weight of injuring my best friend. As you can imagine I felt like a horrible monster-friend for having just caused someone so much pain. She was bawling. I was bawling. Both of our moms were trying to comfort us and take care of logistics. It was awful. AWFUL! I vowed to myself then and there that never again would I inflict such pain on another human being. Haha, poor Bekah…was this at The Mason Road Skate Rink? The owners used to be our neighbors. We’ve known them for years, and my brother worked there when he was like 13-16. One of my biggest fears in life is that something horrible/random like that will happen to my teeth lol. No, this was at “Party Skate” on Highway 6 really close to my school. And yes, this too is something I constantly fear happening to my teeth, but only because it has actually happened to me before, and 20+ years later my nerve endings remember that pain all too well.. I had to stop reading at “strange obsession with wolves”. Busted out laughing in the middle of cube land where I work every now and then as a contractor. I don’t belong in this office as it is, and shouldn’t be laughing at my monitor. Will have to read the rest later. YOU CRACK ME UP! YESSS!!! Krista and I will be capitalizing on all of our embarrassing childhood obsessions. I mean, the memories of them (and our fashions) sometimes haunt us, but if sharing them with the world means people can laugh at inappropriate times while in their cubicles, then who are we to say no? Thanks for reading, commenting on, and following our blog! We’re excited to see people enjoying our stories. Can a Girl Just Cry in Peace?